Internet Explorer 7 and Internet Explorer 8 offer tabbed browsing (and Internet Explorer 9 keeps the direction), which means that you'll easily have more web pages opened at any given point, and that it makes it easier to accidentally close a tab you wanted to keep working on now or later. In this tutorial, we will show you how to reopen a browser tab you accidentally closed, and show you a special feature that allows you to reopen all tabs you closed during this particular browsing session! The implication is that it refers to the web browser tab you closed last. Either click on that command, or press the equivalent keyboard shortcut of Ctrl+Shift+T, and Internet Explorer will reopen that tab back up! If you want to reopen a particular closed tab, not necessarily the last one you closed, just right-click on any of the browser tabs Internet Explorer currently has open, and this time choose the "Recently Closed Tabs" submenu. You will now see a listing of websites / web pages you have recently closed, from most recently closed at the top, and oldest at the bottom. Just click on the name of the web page you want to reopen, and you're done! Internet Explorer Tip: whenever you open a new tab in Internet Explorer, it will also give you a listing of recently closed tabs (unless you manually configured and changed the default "new-tab" behavior). 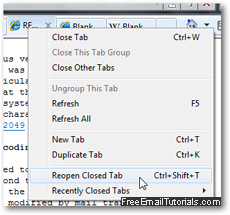 As you may have already discovered from the previous steps, you can easily reopen all tabs you have closed since you last started Internet Explorer. To do so, just right-click on a tab, and choose the "Recently Closed Tabs" submenu. At the very bottom of the submenu, you will find a "Open All Closed Tabs" menu item; click on it, and Internet Explorer will open back up all browser tabs you closed since you last launched Internet Explorer!